After releasing in the United States last year, Amazon’s Echo Spot has finally made its way to Canada. While Amazon’s display-clad, significantly bulkier Echo Show — which hasn’t released in Canada yet — lacked the typical design flourish expected from Amazon’s Echo products, the Spot is sleek and impressive. It’s the type of gadget that looks right at home in the average bedroom, desk or even kitchen. Similar to when the Amazon Echo first made its way to Canada last year, the Spot is lacking in the ‘Skills’ department when it comes to video — at least right now. It’s also worth pointing out that I haven’t found the Spot’s tiny display all that useful beyond using it as a digital bedside alarm clock. 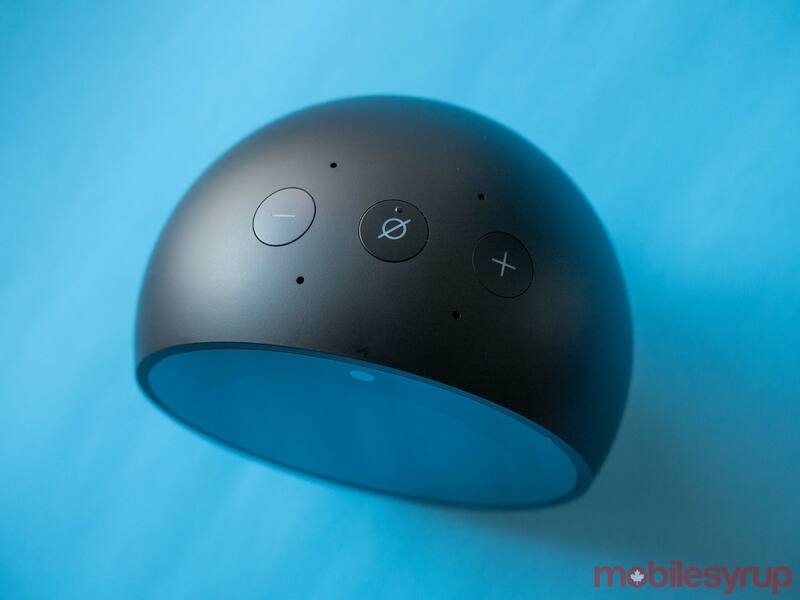 The Echo Spot is unlike any Echo device released so far in Canada. 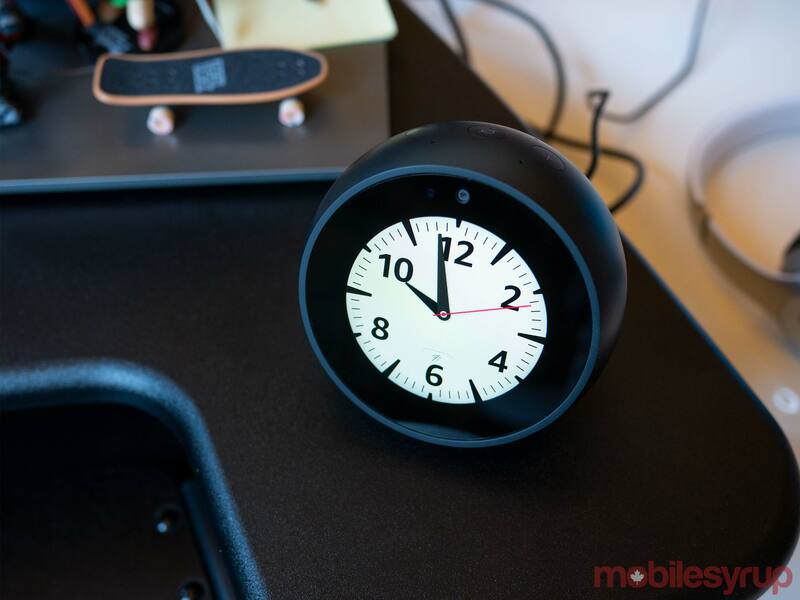 It ditches the cylindrical design of the 2nd Gen Echo, Echo Plus and Echo Dot for a curved shell that has more in common with a traditional alarm clock. This makes the Spot blend easily into its surroundings, unlike the more tech device-looking 2nd Gen Echo and Echo Dot. In many ways the Spot seems like a refinement of Amazon’s first Echo devices, amounting to a cross between the Echo Dot and a smaller, sleeker version of the Echo Show that comes in at about the same size as a Mango. In general, the Spot is by far my favourite looking Echo yet. Above the Spot’s display is a camera for video calls, with three buttons — volume up, volume down, and a mute button for the mic — running across the top of the device. The Spot also features four far-field mics in a square around the buttons located on the top of the smart speaker. The rear of the device houses a 3.5mm headphone jack, just like most Echo devices. 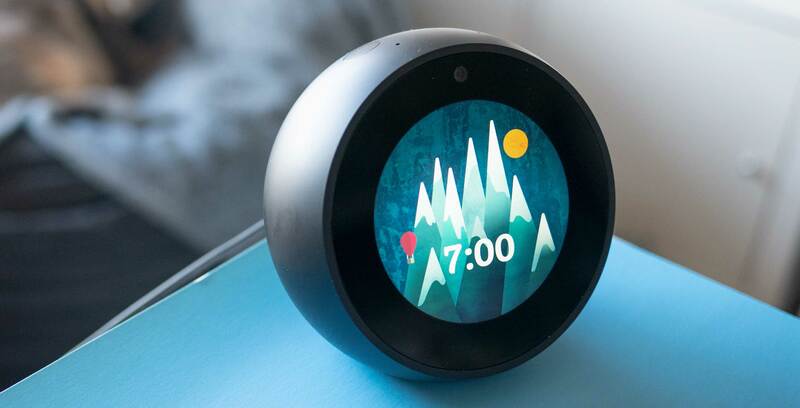 The smart speaker-alarm clock also features Bluetooth connectivity. Finally, the Spot’s speaker grill is tucked just under its display. 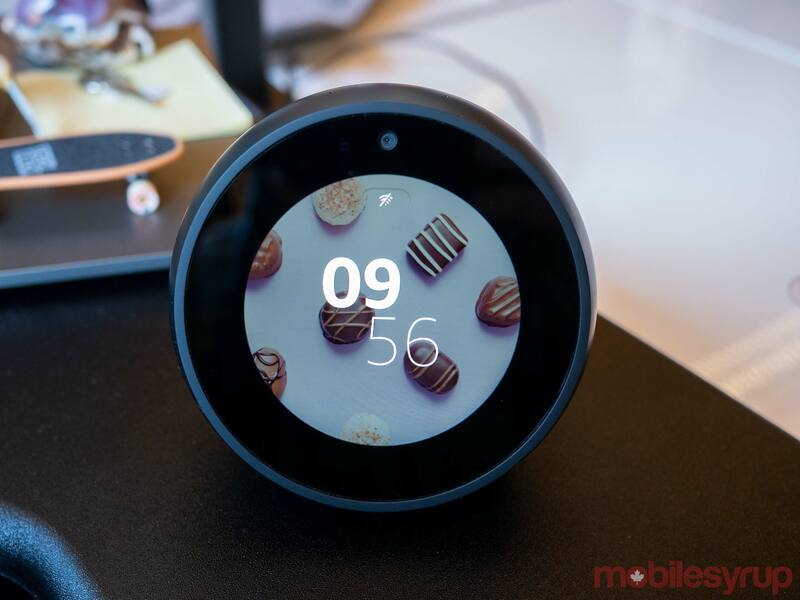 Since the Echo Spot features a 2.5-inch 480×480 pixel display, the majority of the device’s setup process can actually be performed directly on the device, unlike other Amazon Echo devices that require the use of Amazon’s Alexa app. While it’s a little difficult at times to input specific details using an on-screen keyboard on the Spot’s tiny display, including logging into your Amazon account, the whole process only takes a few minutes and is smoother than setting up an Echo device via a mobile app. There’s also a useful Amazon promo video that shows off what the Spot is capable of, as well as a helpful list of commands that can be used with the device, giving new users a better handle on the device (these prompts can also be turned off in the settings). In terms of the Spot’s home screen, you have access to messages, weather, notifications, upcoming events, reminders, Amazon’s drop-in video calling feature, and trending topics, all by swiping left and right on the device’s screen. While navigating the Spot’s display can be finicky at times given how small it is, especially when swapping out the device’s myriad of colourful alarm click faces, it gets the job done in most situations. But what about the skills? This is where things get interesting. 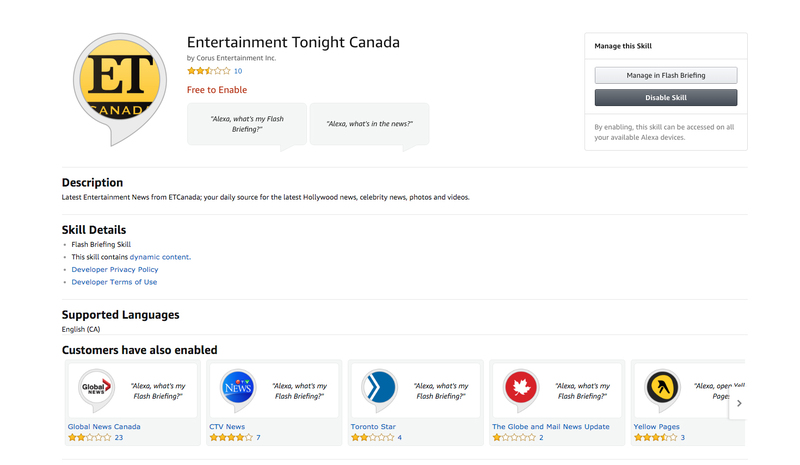 All of the standard Alexa Skills that are already available in Canada are also compatible with the Spot, though because the device features a display, it’s also capable of running what Amazon calls Video Skills. While I expected the Spot’s selection of Skills to be limited in Canada at launch, there are far fewer video Flash Briefs than I anticipated. “As with all the Alexa Skills, there are new Skills being developed and added on an ongoing basis, so there will be more to come in the near future.” It’s likely that the Video Skill situation will improve in the coming weeks and months, but as it stands right now, the Spot’s video briefing offerings are pretty sparse. It’s also worth mentioning that it’s possible to watch Amazon Prime Video content on the Echo Spot, though the device’s display is so small I couldn’t even tell what was going on while watching Man in The High Castle during the brief period of time I tested out the feature, especially given that most video is 16:9 and cut off by the rounded screen. There is an option to zoom the picture in order to fit the display, which actually made it easier to watch Video Skill Flash Briefings on the device. There’s also no YouTube support given Amazon is in an ongoing battle with Google right now, which is disappointing. Room calling, which turns the Echo Spot into an intercom of sorts, worked great in my experience. All you need to do is ask Alexa to drop into another Spot speaker and your face will pop up on the display, similar to Apple’s FaceTime video calling platform. It’s also possible to drop-in on people in your phone book if you have the feature enabled and if the person you’re calling also has it turned on. A blurred image appears for 10 seconds or so, giving you the chance to clean up the surrounding area and pull yourself together before the call begins. While I only tested out this feature once, it worked quite well. I have little interest in allowing someone to drop in on my apartment via video completely unannounced. Still, if this is a feature that interests you, it’s there and it works quite well. Also, some might be concerned about having an internet-connected video camera in their bedroom (if that’s where you decide to place the Spot in your home), though it is possible to turn the camera off within the device’s settings. 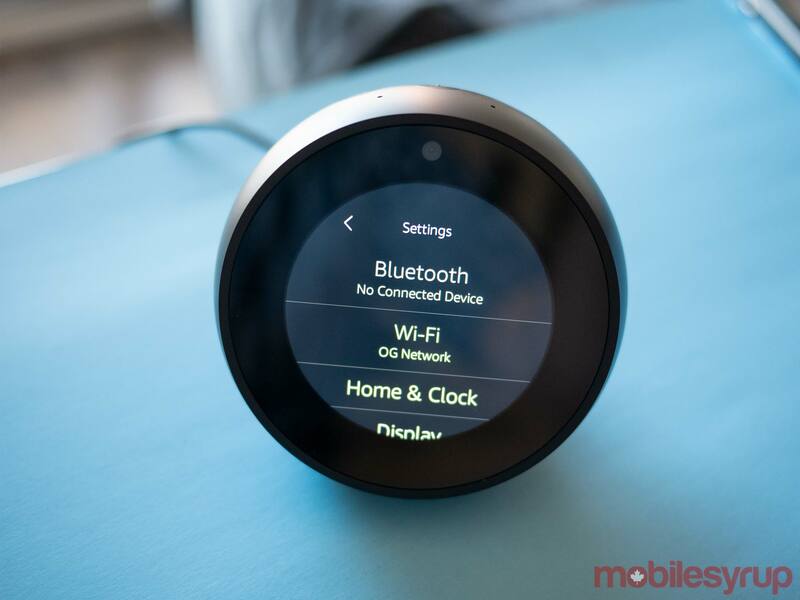 Other Echo features like Spotify and Amazon Music integration, are also compatible with the Spot and feature a graphical interface that shows off which particular track is playing. Amazon Music even has the added bonus of displaying lyrics on the screen when a song is playing. I’ve also seen the Spot be used as a smart camera monitor, giving users access to a video link-up on-screen with products like Ring’s smart doorbell, or a Wi-Fi-enabled Echo compatible baby monitor. That said, I wasn’t able to test this feature during my time with the device. Then there’s the Spot’s audio quality. 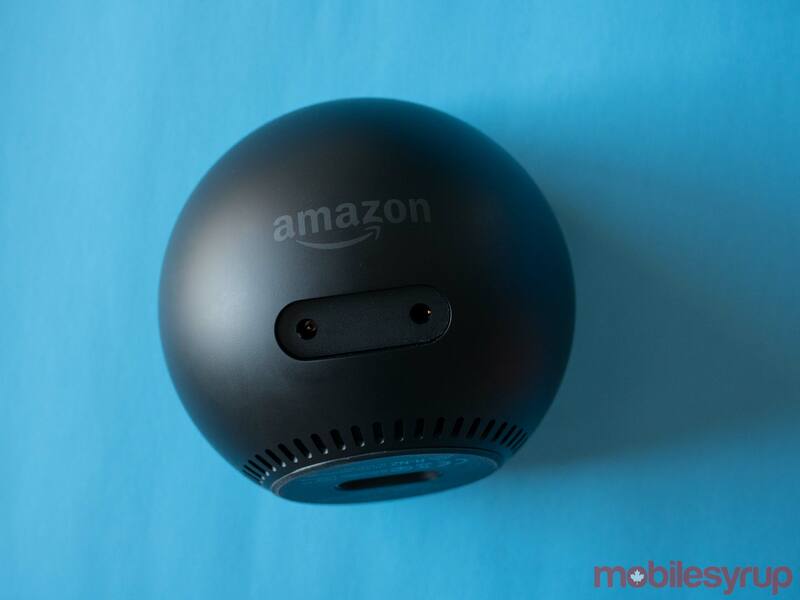 While the Spot’s 1.4-inch speaker sounds better than the Dot’s tiny speaker, especially when Alexa is talking, its sound quality doesn’t compare to the full-sized Echo (2nd Generation), Echo Plus and to a lesser extent, even the Google Home. With this in mind, it is still possible to link the Echo Spot to an external speaker via its 3.5mm headphone jack, or via Bluetooth. Make no mistake though, the Echo Spot isn’t the smart speaker for you if you’re looking for a high-quality audio device. A device like the Echo Plus or even the Google Home Max is likely a better option if that’s what you’re looking for. Is the Spot worth it? For me, the Spot's price is an important consideration when deciding if it's the right Echo device for you. While the Spot is undeniably a more capable smart speaker than Amazon's other offerings, it's also somewhat pricey, coming in at $169 CAD. To put this price in perspective, the standard Echo (2nd Generation) is priced at $109, while the Echo Plus comes in at $169 and the Echo Dot is just $59. It's also worth noting that as expected, issues that continue to plague Amazon's other Echo devices also remain with the Spot, including the fact that Alexa just isn't as capable a virtual helper as Google Assistant. Unlike Google's voice-activated Assistant, Alexa can only source information from specific sources like Wikipedia, and in most cases can't answer the same random questions its main competitor is capable of. Whether or not the Spot makes sense to you will come down to how valuable a display is given how you use the Echo. If, like me, your primary purpose for the Echo is a way to control disparate smart home devices, then the addition of a display likely won't be that useful. That said, if you're looking for a high-tech alarm clock that also features Alexa integration, then the Spot could be the smart home speaker you've been waiting for. "Whether or not the Spot makes sense to you will come down to how valuable a display is given how you use the Echo."